This work of art belongs to a collection of the Foundation “Casa Ducal de Medinaceli”, in Seville. 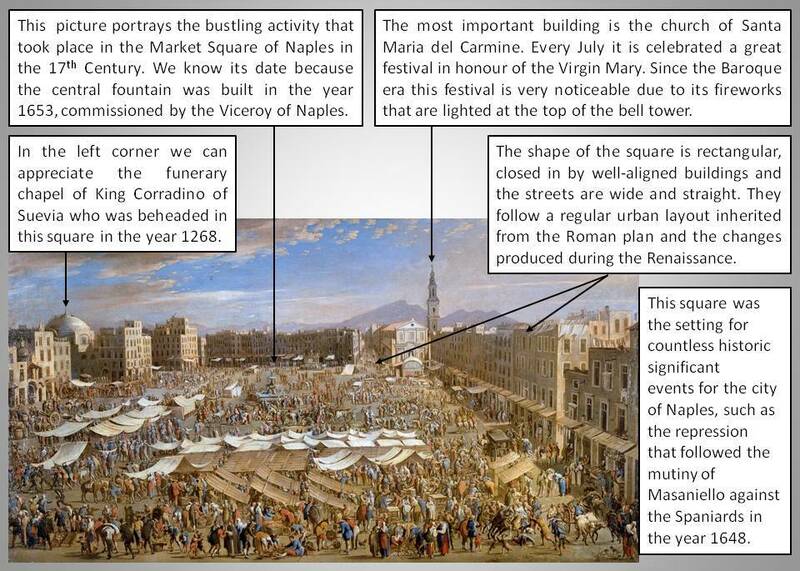 It represents the Market Square or Piazza del Carmine of Naples, around 1654. The painter is Domenico Gargiulo, as his signature in the bottom right border points out: “DG”. Recently it has been exposed to the public in the Thyssen Museum in Madrid, as part of the exhibition entitled “Painted Architectures”. It is a painting of urban perspective, which is characteristic of Italian baroque painting. This type of painting centered its attention on urban life and social activities during the XVII and XVIII centuries. This image portrays with a great amount of details and chromatic variety, not only the appearance that this central Neapolitan square had, but also the bustling activity that took place there on market days. The space is full of market stalls, merchants, buyers, characters with all sorts of professions, animals, carriages and an endless number of objects that turns it into the centre of everyday life of that age. In the image, we can appreciate part of the urban layout of the city. The shape of the square is rectangular, closed in by well-aligned buildings. The streets leading up to the square are wide and straight, inherited from the regular Greco-Roman plan and urban alterations produced in Naples during the Renaissance and Baroque. The street that we see in perspective stands out in the background, next to the Santa María del Carmine Church. In addition, the composition is spectacular because of the presence of the volcano Mount Vesuvius on the horizon. Regarding the buildings, the majority had a public space on the ground floor, designated for the tavern or shop, while the residence was situated on the upper floors. In the right margin, we can appreciate the large number of market stalls and counters that stand out. On the other hand, on the upper terraces we can distinguish the clothes hanging out to dry in the sun, making reference to the private activities. It is curious to note that this Square was the setting for countless historic significant events for the city of Naples, such as the beheading of King Corradino of Suevia in 1268, or the violent repression that followed the mutiny of Madaniello against the Spaniards in 1648. Regarding the monuments in the scene, the Church of Carmine stands out in the background, the funeral chapel of King Corradino in the left corner, and the central fountain, commissioned by the Count Ognate, Viceroy of Naples, in the year 1653. This entry was tagged Nápoles. Bookmark the permalink.